Part of the cirrocumulus family, the cirrocumulus stratiformis refers to a type of cloud that are often described as a widespread flat veil distributed over a large portion of the sky. Because they are included in the cirrocumulus category it is an indicator that they have a wisp and coiled appearance. However, it is important to note that they are not as puffed or full as the cumulus cloud formations and they are often confused with the altocumulus formations. The stratiformis classification is another pointer regarding this formation, as the Latin name means stretched and prolonged. What are the cirrocumulus stratiformis clouds? In general, the cirrocumulus stratiformis configuration implies several smaller cirrocumulus clouds that are separated by rifts. Consequentially, this is the main reason why the stratiformis pattern can occupy such a large area of the sky. Even though they can easily be confused with the lower and upper cloud structures, what makes this arrangement easy to identify is that they are quite thin. What this entails is that these clouds will very rarely produce shade. In fact, they only time they show shading is when the sun’s location is very low. How are cirrocumulus stratiformis clouds formed? These cloud patterns are usually the result of the convection process, meaning that their development depends on heat transfer. Similar to all subcategories of the cirrocumulus clouds, the stratiformis structures incorporate a certain amount of water vapors that are overcooled once they reach an altitude of over six thousand feet. There, the atmospheric conditions that include high humidity along with shifting winds are the main reason for their shape. Because the temperature at that altitude is usually below zero degrees Celsius, the water vapors become solid and take the shape of ice crystals. 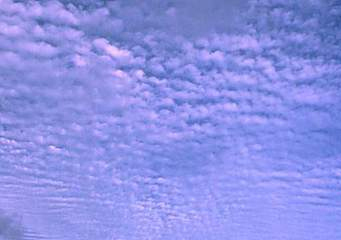 Depending on how much moisture they contain, sometimes the cirrocumulus clouds ensure the transition to the cirrostratus clouds. How common are cirrocumulus stratiformis clouds? This cloud pattern is very common and they can be seen across the globe. However, considering that they need cold atmospheric air fronts in order to take their shape, they are more common during late autumn, winter and early spring. In case you observe such a cloud in winter, then you will be glad to learn that it is an indicator of fair, but also chilly weather. On the other hand, in the tropical regions, the formation of these clouds in the sky can sometimes by a sign of an impending hurricane. Where can I see cirrocumulus stratiformis clouds?